The Riese & Muller Charger GT Vario HS is equipped with The Bosch Performance Speed motor delivers full power up to 45 km/h (28 mph). With the continuous Enviolo hub gear with no gaps between gear changes and the Gates belt drive, your ride won’t just be sporty, but it’ll also be superbly comfortable. Hydraulic Magura MT4 disc brakes ensure safety at high speeds. Wide Schwalbe Super Moto-X tires provide traction and grip on any terrain, whether cobbles, country lanes or forest tracks. Motor: The Riese & Muller Charger GT Vario HS comes with Bosch Performance Speed. Sporty start-up characteristics, 350 watts of power and pedal up to a speed of 28 mp/h makes the Performance Speed drive the fastest Bosch E-Bike motor. Sporty start-up characteristics, 350 watts of power and pedal assistance up to 275 % guarantee the ultimate riding pleasure with a maximum drive torque of up to 63 Nm with derailleur gear and up to 50 Nm with hub gear. 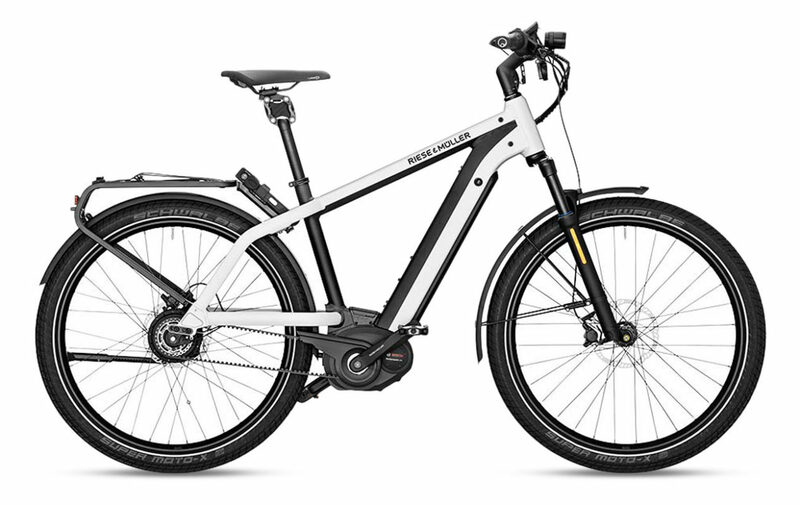 Brakes: The Riese & Muller Charger GT Vario HS is equipped with Magura MT4, disc brakes. It gives you enhanced riding and braking performance. The innovative technology provides a perfect combination of impeccable brake reliability and control. Top Speed: The Riese & Muller Charger GT Vario HS delivers full speed power with a top speed of 45 km/h (28 mph). If you’re looking for more speed, check out our fast electric bikes. Accessories: This bike comes with Busch & Müller Lumotec IQ-X E Headlight and Supernova M99, integrated brake light, it also comes with SKS A65 R Fenders, Pletscher Comp 18 Flex Kickstand. Our team has a lot of experience outfitting bikes with additional accessories, so be sure to reach out to us if there’s anything you may need.